The raindrops are hitting the windshield as I pull onto the property. Not what I was hoping for on this day. Both of my pups, GU and CHOMPS, are behind the passenger seat in the sleeping bag wondering why we were up so early and especially so since it was wet outside. It’s 4am and I am running a little behind my start time as I still need to set up all my food on my pit stop table and get my lights hooked up. Today is the day I’d been waiting and trying to train for. Today is my EVERESTING attempt of Hearst Road, the road the buses take up the Hearst Castle in San Simeon, California. I wanted to do a fundraiser for the local dog rescue (Rescue Alliance – Short ‘n Sweet Dog Rescue) where I adopted my oldest dog GU 13 years ago. It is Thanksgiving Day and this year I wanted to do something to thank Debby Sweet for rescuing GU and to raise money to help her rescue more dogs in the future. First of all, EVERESTING, what is it? Everesting has become an endurance event that became popular in 2013 that has some simple rules. One, you ride your bicycle up and down one hill until your elevation gained is equivalent to the height of Mount Everest, 29,029 feet (8848 meters). Two, this must be done on one ride, so basically no sleeping during the event. Three, you can’t walk up any of the hill. And an original rule that has changed a bit, was that you were supposed to be the first to accomplish it on the chosen hill (this was designed so people would be creative in their attempts but is not an official rule, but first ascender is noted on the Wall of Fame). The distance or time really isn’t important, it’s the total height climbed, so I was planning on 15-20 hours or maybe hoping. It’s hard to believe a month ago I injured myself at work straining my psoas (muscle in hip region) and most of the muscles in my quad. I couldn’t walk and have been going to physical therapy and chiropractor to try to allow me to ride. Up to this point in the year, I haven’t ridden more than 130 miles in a week and only ridden over 1 hour 10 times this year. If I finish, I will have ridden over 160 miles. This should be interesting. Sweat is pouring down my face as the thin Voler rain coat is on over my jersey. It’s drying up on the bottom of the 3.7 mile hill, but the rain and fog mix at the top surrounding the Pergola is making my body temperature question what it’s supposed to do. I’m overheating unless I unzip the jersey and jacket but then on the descent I am shivering and having a hard time gripping the brakes. I’m only on my third ascent, and it is still pitch dark, but the light Lezyne supplied is not giving me any reason to slow down. So no excuses there. I remember one of my favorite climbs, Going to the Sun Road in Glacier National Park. I can still picture the old red tour buses passing us slowly as waterfalls are dripping on the road, and hearing the bus driver announce to his passengers, “Look at the dog with sunglasses in that guy’s backpack.” People were fascinated with GU, aka THE GREAT CHIWEENIE, in my Camelbak as we rode up the climb. People handing us Coke, taking our picture, even having a SUV offer to drive behind us with their lights on during the descent (as we ascended at sunset), which we gladly accepted. GU does garner people’s attention. Oh no! Grabbing my brakes and skidding along the road as I just started the descent. My raincoat I had put under my jersey as I was way too hot fell into my wheel. At least I didn’t wreck. I’m looking forward to this stop at my pit stop where my car and pups are, as Alex, my employee at the kayak shop (Sea For Yourself Kayak Outfitters) is going to bring me small pancakes. The descents are flying by, but I have to be careful as there are some poor conditions in places and the most important is the lower cattle guard that rattled loose my backup power pack on an earlier descent (I was trying to bunny hop it after the first two laps). This is the end of my 6th lap and I see Alex pulling over near my car. I have been stopping every lap to check in on the pups, as neither of them are riding these days partly due to my worsening conditioning and as they’ve gotten older I’ve worried more about the thing most people who ride with their pets don’t consider, what happens if you wreck. Ten years ago, GU and I were going to go on a 3 hour ride, but I decided to do my 15 mile hard local ride. I was grateful that I didn’t take GU that day, as I was riding up Highway 1 heading South in a crazy wide shoulder, I see someone pull off of Cambria Drive in front of a descending SUV and both lost control. I headed for the grass as I knew they were heading my way and I somehow broke multiple windows on her SUV (not her fault) and I flew into the trees and bushes about 50 feet away from the road. I had always worried about my pups when I rode and this just reinforced my biggest fear of hurting them. Yeah, I was injured that day, but I was relieved I didn’t have GU on that ride and on every ride we did after that date I continued to constantly think what I would do to keep him from getting hurt, how would I fall, when should I slow down and so on. These pancakes are awesome as Alex lets out the pups from the car. “Go potty!”, as they came over to beg for food. My breath is not coming back. I’m on a descent and I can’t catch my breath. I open the car door as I just finished the lap and grab my inhaler. The doctors say I have asthma, but sometimes I think it is just me being out of the shape I once was in. This time was an asthma attack. I think all the smoke from the previous weeks fires up in Chico area and the cold foggy temperatures up on top of the hill has caught up to me. GU and CHOMPS are both looking at me usually hoping for a cookie, but this is one of the times they are checking up on me. In the past, I’ve had a history of passing out when I’m sick or injured…I have passed out over 100 times in my life, so it doesn’t panic me, but it does freak out anyone who might see me keel over. There have been times when I’ve woken up on the floor as GU is licking my face getting me back as I come back into conscious or the few times I’ve cracked my head open and he works on the wound till I come through. I’ll just eat a bagel while I’m here. Pancakes are awesome as Alex lets out the pups from the car. “Go potty!”, as they came over to beg for food. The last few laps my muscles feel fine up the climb, but my head is sluggish and I’ve been doubting myself since the asthma attack. I keep repeating to myself, “keep on pedaling” and “I’m gonna rescue more pups like GU and CHOMPS”. It’s funny, I’ve been remembering things I haven’t thought of in years. One of my favorite moments following the Tour of Missouri, was the last day in St. Louis. That week GU and I followed every stage and trying to sell the book I self-published (Adventures of the Great Chiweenie) to raise money for Trips for Kids and Petfinder.com. The book was written from GU’s perspective…I had written it after being hit by the SUV as my work wouldn’t let me work due to my injuries so I was bored. I wish I would have taken more time on it, but this trip to Missouri was fun seeing people that I knew from Tour of California, but with a little smaller crowds. On that last day in St. Louis, I was riding around saying goodbye to all those I had met or already known. I was saying bye to a photographer, and I hear “Can I take your picture?”. I turn around and it’s the Columbia Team car with Mark Cavendish, one of the best sprinters in the pro peleton, asking for a picture of GU and Michael Rogers, the time-trial specialist in the passenger seat up front. As Mark took GU’s picture the photographer behind me took pics of the interaction. It makes me smile till this day, remembering their team owner, Bob Stapleton, always being so friendly to us in all the years. The smiles GU brings out is why I rode with him. I see some people up on the switchback portion with their two vehicles and I’m finally at a comfortable temperature. The sun has been out the past few laps and I’m on lap 11 of just over 22. Mentally I’ve been just trying to get to the halfway point, I’m way behind the schedule I wanted, but realizing most of the time I’m losing is off the bike when I’m down with my pups. My legs still feel good except for a little niggle in my left knee (some swelling). The people on the switchback are cheering me on. I look down at my heart rate and make sure I don’t speed up as these are the only people I’ve seen all day on the climb (the road is closed to public and to buses on this day). It’s amazing how you feel when people cheer you on. I realized when I was riding that even though I don’t want to be center of attention, sometimes you need to if you want attention to the causes you believe in, like pet adoption. Unwrapping the GU (the energy gel) to eat as I’m about to crest and turn for the descent. I just had a gray fox cross the road in front of me, but right now I stop and see a litter of foxes looking at me from just off the road. Earlier I had seen coyotes and a bobcat with a rabbit in its mouth, not to mention the many raptors including bald and golden eagles. The foxes remind me of my pups begging even though they are 50 meters away from me. I think they heard the wrapper of the GU. I must be tired as I start to get weepy eyes. Seeing these foxes is making me happy but making me a tad sad. I start wondering how my pups are doing in the car and wonder how much longer they will be with me in this life. They’ve been my best friends for all the good times, but also for the bad. They are with me every day and I base my work and personal life around them. GU turns 14 on the 29th of November, one week from today. He’s ridden over 10,000 miles in his life in the backpack (CHOMPS has less than 1000). I remember that last race I rode my last lap of a 24 hour solo race with them…I won my age group and wanted to finish my day with them. I’ve only raced a few races since then as a divorce and new job running the kayak shop took away some of my motivation for riding and for life at times. I joke about it, but there have been days in my life where they only happy part of the day was having GU wake up and slowly walk on bed, so not to step on CHOMPS under the blanket, and stare at me till I opened my eyes and he’d give me the head hug, pushing his head against mine and wagging his tail. The foxes- just ran away. That was nice. I’ve been on a roll the last few laps. My heart rate has stayed lower, my legs don’t hurt, and mentally I know I can finish, it’s just a matter of how long do I want to be out here. The sun went down hours ago and the temperature is in low 40’s to high 30’s and it has started to rain again. I’m sitting in the car with heat on hoping to warm up as I’m on 3rd set of clothes (Voler) and all of them are wet. My Lezyne light and GPS are still working fine, I’m fine on GU’s, but low on electrolyte. I just tried a different brand since I ran out of the GU Energy brand. Only a few laps to go. I’m gonna start lap 21 here in a moment. I think GU and CHOMPS are back asleep as they came out to see me when I got into the car, but now they are snoring under the blankets and sleeping bags. I’m surprised as GU doesn’t do well with rain hitting the car as it can scare him due to his bad eyesight. That is the original reason he wore goggles during our rides was to protect his eyes from getting worse. I can picture him shaking his head to make them get off his eyes if I had taken too long of a break. That’s better than CHOMPS who grabs them with 2 paws and flings them off (sometimes me not realizing till up on top of climb and having to go back to find them). I better get going. I’m glad the Hearst Ranch gave me the code to this bathroom at the Pergola. I parked my bike at my turnaround and walked over to here and am sitting on toilet hoping my body will come back to me. On this climb up (21st) I didn’t feel bad breathing or muscle, but all of a sudden I felt like everything was going to come out of me one way or the other. I looked around for something to wipe in case it came to that, but nothing was around. Blackness was surrounding my vision so I laid down in the middle of the road in the pouring rain hoping this will just pass. I keep hoping to see a mountain lion (was lucky to work with them back in the day), but also didn’t want to be easy lion food. I kept my eyes open and laid there for 20 minutes. I then rode to here slowly. I know I only have one more full climb then maybe 1/3 of a climb after that. It’s already Friday and now I’m looking to try to finish before 24 hours have passed. My lights are starting to dim and even the skunk with it’s tail raised didn’t scare me as it was second time I had seen it. I’m going to finish. I just went past 29,029, but want to make sure of the elevation so I’ll ride to the end of this straightaway. I’m happy to see my pups. GU came over to lick my hand as I just cleaned off the pit stop with all the food. I would like to think he did it lovingly, but must have had food on my hand. Officially done at 4:10 am on Friday November 23rd… I started officially at 4:20 am on Thursday November 22nd. Thanks to everyone who donated…we will keep taking donations even thought the event is over. Thanks to Lezyne, GU Energy, Voler Apparel, K-Man Cyclery, Wally’s Bikes, and Hearst Ranch/Corporation. I know I’m missing some, but thanks to anyone who helped in one way or another. Adopt a Pet. Ride a Bike. Smile! Rescue Alliance – Short ‘n Sweet Dog Rescue is located off the 46 on Jack Creek Road. This Sunday we celebrate the mother’s in the world, and with that I’m writing my first blog post. My mom was the nicest person I ever met and she was my mom. She was always there to support me in everything I did or wanted to do. I don’t know if she would have ever kayaked, but she would have enjoyed watching others do so. My mom passed away years ago from Multiple Myeloma. She was still nice and still my mom till the day she died. She would do anything possible to help people and I live everyday trying to live up to her high standards of living, even though she would never want me to feel like I needed to live up to her…I want to. Her birthday was August 8th. Last year, in memory of her, I gave everything we made on that day to Multiple Myeloma Research Foundation (MMRF.org). This year and every year I own my business, I will be donating all the money we make on that day (employees donated their time last year) to something she would believe in. I’m going to donate to MMRF again this year, and am thinking of donating to PETFINDER.com next year. To anyone that knew her, knew she loved our pets, and they made her smile even more than she did already. 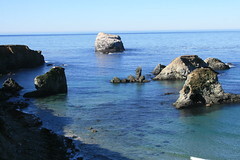 We will be running our normal 10am San Simeon Cove tour and if demand is there, will run a 7am tour as well. Reservations are needed for the tours. We will also be renting everything as well if you want to go out on your own. As the date approaches, I will know better if we will have someone working the beach the whole day or not (depends on tour sign-ups). More info and updates to our website the next couple of weeks. Enjoy this upcoming weekend and celebrate your mom and the day itself. The picture was taken on May 1st 2014. This is a reflection of the sun and 2 plane trails on the water. We have beautiful water quite often, but this glassiness was heavenly. New Website for the 2010 Season! Welcome to our new look and enhanced functionality. Check out the gallery. We are finally able to share new photos with you. The gallery runs on Flickr and is a fun easy way for us to get our photos published. Keep checking back as we add new images. © Copyright 2010-2019 Kayak Outfitters / Flash Buddy :: All rights reserved. Powered by WordPress Hosting :: WordPress Theme created by Flash Buddy.